This link actually came to my attention in an email. It is a short, heartwarming, wonderful film that I want to make sure you are aware of, so you too can enjoy. A film that will go down in history! Gary Sinese has made this all happen. Do you know who he is? Well, by throwing the name out to me, I didn't have a clue, but, after seeing this film, I found I knew who he was all along! Kudos to Gary and his uncle! Sleeping dog TV also did an awesome job filming this. I have no connection to the filming company or any person involved in this great film. I just enjoyed and wanted to share. We should all have such a wonderful "Oral History" to share. With the end of this "Great Swedish Adventure" has come an awful lot of emotion. Because this experience has been documented and will be a part of my history, I feel there has to be one more follow up post. A post, shall we say, on the aftermath of this experience. I knew I needed a couple of days to unwind from this experience, and I was not wrong. I have felt numb and have just barely functioned, doing only what I absolutely had to do. It has been a tougher come down than I expected. I started this adventure because the timing couldn't have been any better for me. I was trying to plan a trip to Sweden this year as it was. I want to meet my cousin who found me last last year through this blog. In fact, I want to meet all of the family there! I received the email this evening. I did not make it for the show. The email stated that they liked me a lot and that I had been a favorite. They were very surprised and thrilled that there were so many "interesting people" who had applied for the TV show. Supposedly there were a total of 1300 applicants, which eventually went down to 200 applicants for phone interviews. From there 50 were chosen to be interviewed in person. I thought there were 40 being interviewed in person, that number changed as did the total amount of applicants. People just kept applying! Upon leaving the little restaurant from lunch, I decided to take a few more pictures of some of the "stars" with my phone. It didn't take long, to return to the office where I had been interviewed. There was a guy on the couch who was waiting to go back to the airport. I asked if anyone wanted to see my passport as no one had looked at it during my interview. Even though the paperwork stated to bring my passport, they apparently didn't want or need to see it. At least I knew it wasn't overlooked. 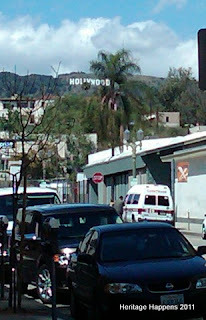 After phone conversations with my husband and daughter I continued on to Hollywood Blvd. I was looking for a quiet little place where I could enjoy a sandwich and put my Nook to good use! I have been downloading books to it, but hadn't started reading anything yet. 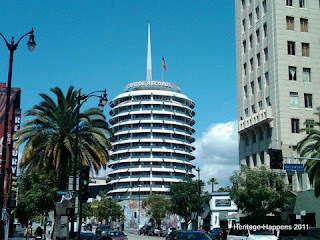 As I walked a couple blocks on Hollywood Blvd. I used my phone to take a few photos of the "Stars." It had been many years since I had been in this area. In fact, when I figured out how long it had been, I decided not to share because it made me feel really old! I couldn't even imagine how many "stars" must have been added since the last time my eye's saw these sidewalks. 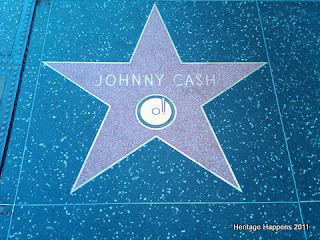 There are blocks of stars, up and down Hollywood Blvd. and many of the side streets. I couldn't image how long it would take to get a picture of every star. Must get back to interview day! Wasted to much time already on negatives! Thank you all for your support, I appreciate the positive feedback from everyone and especially those that took the time to write me personally. I have an amazing group of GeneaBlogger friends and family, and for that I am extremely grateful. On the morning of April 11, I received notification of a comment for my blog post, "Great Swedish Adventure ~ Part 8." The comment was from "Anonymous," and it arrived just two days after I made the trip to LA for my interview. Upon returning home, I was feeling so wonderful, happy and appreciative of all of my experiences with the "Great Swedish Adventure!" I was really caught off guard and felt like I had been slapped upside the head with a wet noodle when I read this particular comment from "anonymous." I originally chose not to allow this comment to go through to my blog. It is, after all, my blog and if I choose not to have drama on my blog, then I choose not to have drama on my blog! Pretty amazing, the decision is up to ME! I know everyone has been waiting for a post to hear how the interview went in LA. I apologize, I was side swiped upside my head, but that is another story. I have to tell you that it was so much fun, a totally awesome experience! I feel very fortunate having been able to participate in this whole affair. A once in a lifetime deal! I am so glad I chose to apply, even if I am not chosen as one of the final ten! I flew out of San Jose airport at 9:00am Saturday morning and landed in LA about 10:15 am. I hadn't received the information regarding my transportation from the airport to my final destination, so on my way to the airport I sent a message explaining that I never received this information as promised. After the plane landed, and service was available, I turned on my phone. Thankfully the information I was waiting for was there, as was a person to pick me up from the airport! I have to say, I certainly was being well taken care of! The past week had been crazy busy for me! I am grateful that it was. It meant I didn't have time at all to make myself nervous or worry about the upcoming interview in Los Angeles with the TV program's director, and two casting individuals, one of which is the casting director. As you may remember, I started a dog sitting business in my home this year. I happened to have three beautiful, large dogs to care for this past week, along with my own dog. I also cared for my grandchildren three full days and worked a couple of shifts at the yoga studio. I felt fortunate that I was able to squeeze in Thomas MacEntee'sfantastic Webinar hosted by Legacy~ "Building a Research Toolbox." I am flying to LA for the interview TOMORROW! It has been a very crazy, busy week for me, but I won't even get into that. Actually, that has been great because I didn't have time to dwell or get nervous about the interview tomorrow. A couple weeks ago, after I was informed that I made it to this level, I began receiving contacts left and right by people from the TV company. There were phone calls and emails like crazy. It made me wonder if I was a famous person already and didn't even know it....just kidding, but I feel like I understood maybe a bit of what it was like to be a star. The only difference is, stars have someone who handles all of their business for them, they don't take care of these things themselves. Edit: April 6, 2011 Adding ~ "If you have been following along with this adventure already, I thank you! If you are new to my blog or are not up to date with this series of posts, I suggest you go back and readPart 1,Part 2,Part 3,Part 4,Part 5, Part 6before continuing on here with Part 7." In the beginning, back in February, I entered this audition because I knew if I didn't I would never forgive myself. Yes, I expected to be cut within the first couple of steps. I never imagined I would still be writing about the Great Swedish Adventure! This is what I call AWESOME!